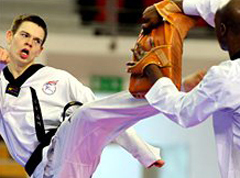 Manchester will host the 2012 European Taekwondo Championships in the build-up to the London Olympics. The actual dates for the event have yet to be confirmed but it will take place about 12 weeks before the 2012 Games. The London 2012 Olympics run from 25 July to 12 August, with the taekwondo competition beginning on 28 July. Manchester’s Sportscity will also host the British International Open later this year on 1-2 October.